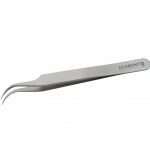 Dumont Diamond Coated tweezers are made of quality stainless steel and are diamond-plated for exceptional gripping power. 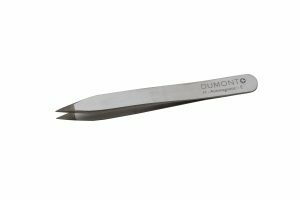 Dumont Diamond Coated anti-magnetic tweezers will be the ONLY tweezer you need for the rest of your esthetic career! If you have ever cursed out a pair of tweezers because they wouldn’t grab the teeny tiny hairs you were trying to pull, look no further! I can’t say enough good things about these tweezers! Each tweezer features the finest stainless steel Dumont’s Swiss factory has to offer. Every tip is also electroplated with diamonds, ensuring superior gripping power. Use for eyebrow design, and for use with your ThermoLo, ThermoClear, Skin Classic or Lamprobe when removing electrocoagulated sebaceous material. To clean: Under NO circumstances should you use alcohol, or an alcohol-based cleanser, to disinfect your tweezers. Alcohol will dissolve the glue that attaches the crushed diamonds to your tweezers. To clean, scrub with soft brush (I use a toothbrush) and soak in Barbicide, or another non-alcohol based disinfectant. Rinse dry and store in covered container.